It wasn't pretty, but the Pats beat the Jets to move to 5-2 on the season. Patriots coach Bill Belichick wasn't kidding when he called Thursday night's effort against the Jets a "grind-it-out game" before noting that "It was good enough, but it wasn't our best." The only thing that stood in the way of the biggest upset of the season was 58 yards and the left hand of defensive lineman Chris Jones, who blocked kicker Nick Folks' long-range field goal attempt as time expired to give New England the 27-25 victory. The ball fell harmlessly to the ground as the clock wound down to zero, and while the Patriots left the field with a 5-2 record, plenty of questions remain. Chief among them: How does Belichick fix a defense that is now without Jerod Mayo. The Jets ran up and down the field, gaining 218 yards and New England was pretty much helpless to do anything about it. "I'm not taking anything away from what the Jets did, they're a tough team," Patriots defensive end Rob Ninkovich said, via ESPN.com. "They run the ball, they've got a good running back [Ivory] who's a tough downhill runner. Their offensive line is big, strong guys that they're able to run the ball a little bit. We've got to do a lot of things better. I think we're going to continue to get better as the season progresses. There's always corrections to be made." 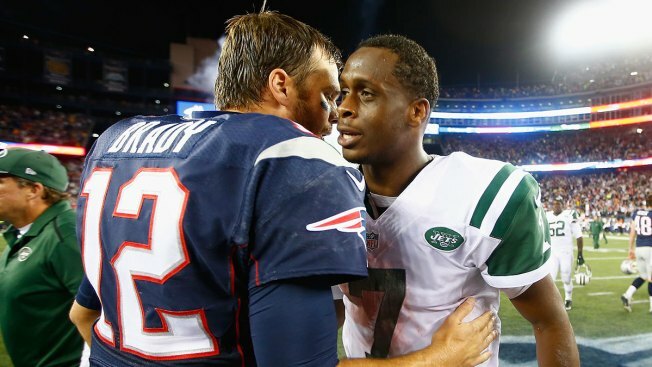 The good news is that while the Jets controlled time of possession (40:54) and first downs (28 to 16), the Patriots' defense stiffened in the red zone; New York scored two touchdowns but also had to settle for four field goals, and that proved to be the difference. "If you can hold them to field goals in this league, you have a better chance of winning," Ninkovich said. "Holding them to field goals was huge, our offense was able to score some points and we came out with the win." It's hard to envision a situation where the Pats don't win the division, but if they want to go anywhere in the playoffs, they'll need to improve -- drastically, some might say -- going forward. "We had our chances to get off the field on third down," Belichick said. "That would eliminate a lot of those plays. And we have to play the run better too. We didn't make them punt until the [third] quarter. ... It was late. Luckily we played well in the red area, kept them out of the end zone and kept the points down." And Patriots defensive lineman Casey Walker added: "We've got to communicate better," Walker said. "A lot of their successful runs, I would say it was on us. We've got some things to iron out this week. It was a short week for us, but at the end of the day, we went out there and we did what we have to do to get the win. That's what matters right now. Then we'll come in and we'll iron out the details. "[Communication needs to improve] between everybody. Majority defensive line, because we communicate between each other with things that we have to do and calls and stuff like that. And also listening to [Dont'a Hightower], to Jamie [Collins] off any calls or stunts. Sometimes we didn't get those and we didn't run them. If we would have ran them, then their success running the ball would have been limited."